So how is our immunity going so far? Did that sneaky breeze or sudden drop in temp take you by surprise? Sometimes it doesn’t take much for a cold or ‘flu virus to take hold – especially when we are super busy, stressed or simply living with someone who already has the winter blues. And those big viruses like Epstein Barr (Glandular Fever) and Ross River Virus can really knock our immunity afterwards! For those of us who are the first to sniffle or snort I have a beaut little tool to share with you. It’s great support for the winter months and great for those of us who are simply rundown in general. My fave ingredient in the Zing Powder is fermented MUSHROOMS. Sounds a bit crazy huh? Well there are three types of mushrooms in Zing Powder renowned for their immune-enhancing properties: Reishi, Shitake and Cordyceps. This time-honoured trio can help keep our immune systems strong and help us bounce back more quickly during recovery. Traditional Chinese Medicine (TCM) also reveres this mushroom trio and has used it for centuries for supporting immunity and increasing longevity. 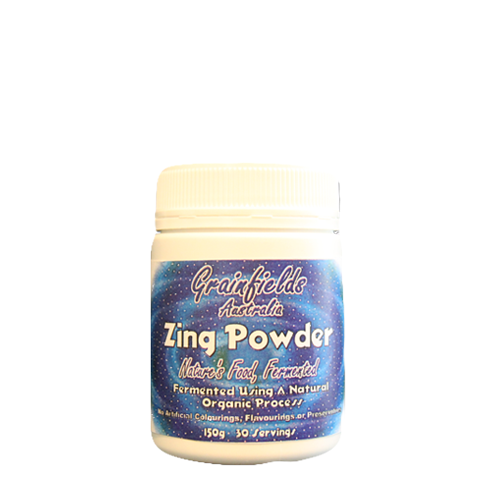 Zing Powder contains 100% fermented mushrooms to ensure we absorb the valuable nutrients. Another ingredient in Zing is Spirulina – many of you may already know about Spirulina. It’s a wonderful algae rich in protein and B Vitamins – perfect during illness or convalescence. And let’s not forget Maca Root Powder in Zing - a rich source of minerals, vitamins, enzymes and essential amino acids. Both Maca and the Mushrooms provide a fantastic source of vegetarian B12. Zing is a vegetarian protein source which is gluten free, casein free and dairy free without artificial flavour, colours or fillers. We don’t need any nasties going into our system while fighting a virus! If you think Zing Powder may be the key this winter, click here. And here’s to a happy and healthy winter season everyone! Remember it takes good guts to gain great health!